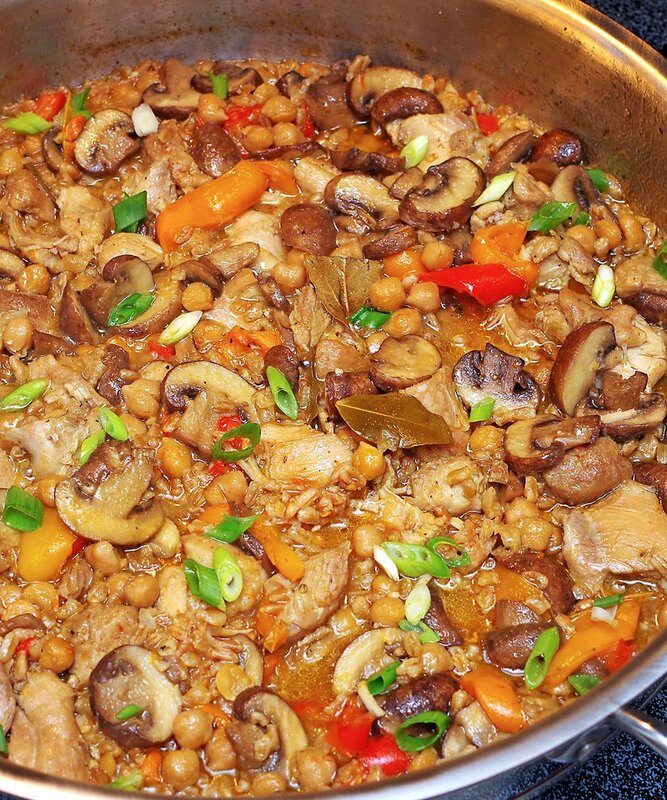 Healthy Tuscany Chicken Farro Stew! An Amazing Flavor! 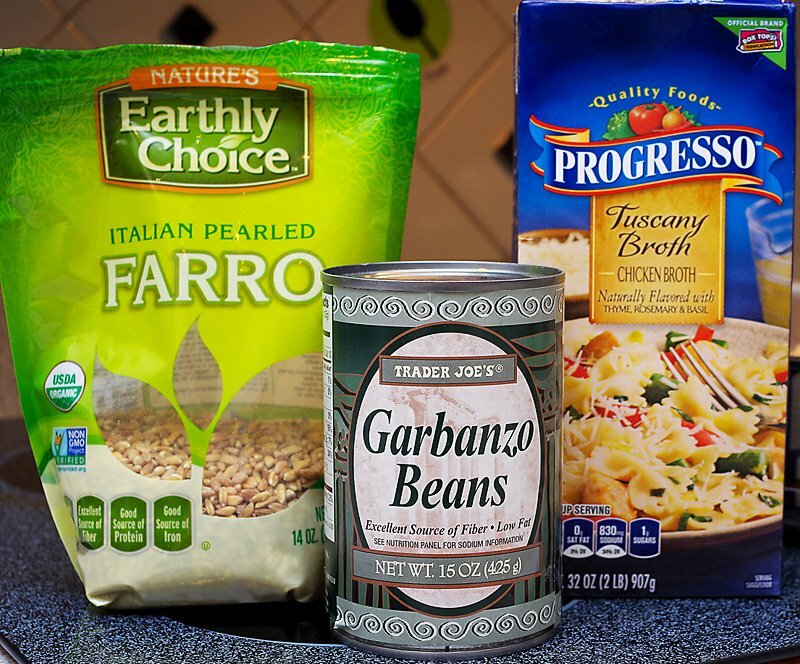 My latest Favorite find is this Tuscany Broth by Progresso! The ingredients are Chicken Broth. Contains less than 1% of: Salt, Sugar, Natural Flavors (including thyme, rosemary, basil, oregano, and marjoram. Once I tried it, I was hooked and got my Mother-in-law hooked on it as well. Look for it at your favorite supermarket. Add it to soups, pasta and rice dishes. I’m sure you are going to Love it! I cook every day, sometimes few times a day, just don’t have the time to upload all of it. But, this one is a WINNER so it gets Featured! I try to cook Healthier meals as much as I can. Once I discovered Farro, I was in Love! If you never tried, I would highly recommend. I never make Plov since the white rice has too many calories. We eat pasta and rice in small portions. I do prefer complex carbs that are slowly absorbed by your body and provide a gradual steady stream of energy throughout the day. Like all whole grains, Farro provides a concentrated dose of complex carbohydrates, especially dietary fiber. Because it contains more fiber than other popular grains like rice or even Quinoa, Farro might have even more positive benefits when it comes to digestion and cardiovascular health. It’s also exceptionally high in protein for a grain and supplies more than 10 different vitamins and minerals. If you like Buckwheat, it has similar nutty texture and flavor. I use it in soups and as a side dish. Dice and brown onion in a deep pan. Turn heat to med-hi, add more oil, then Cook the chicken thighs. for 5 – 10 min on each side until brown. Add Farro, chickpeas, broth, water and bay leaves. Deglaze the pan by scraping the brown bits from the pot. When these dissolve into your sauce, they will add extra flavor. Bring to boil. 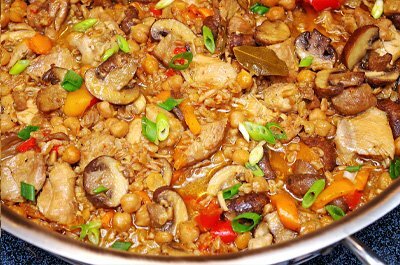 Reduce heat to med-low and simmer for 30 to 40 minutes (uncovered), stirring occasionally or until Farro is fully cooked and chicken pulls apart. Garnish with sliced green onions and serve. 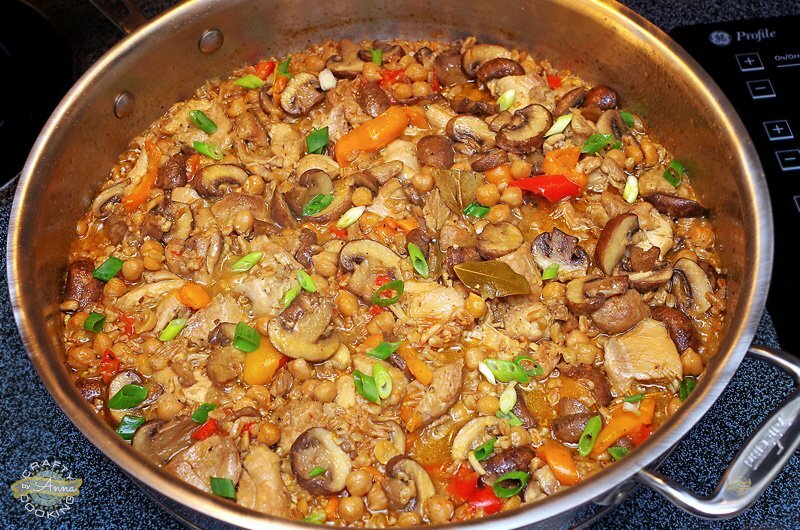 Healthy Tuscany Chicken Farro Stew! Make your own chicken rub by combining: garlic powder, onion powder, paprika, salt and pepper. Rub the chicken pieces on all sides and let them absorb the flavor. Meanwhile, dice and brown onion in a deep pan. Turn heat to med-hi, add more oil, then Cook the chicken thighs. for 5 - 10 min on each side until brown. 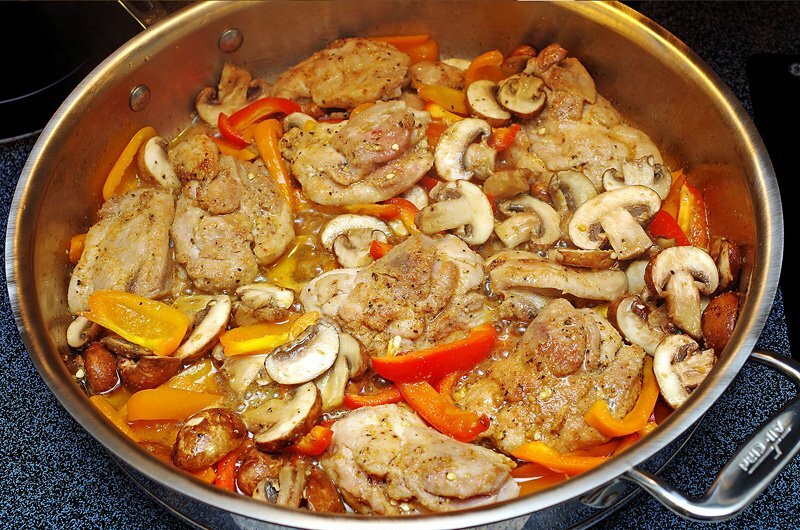 Add sliced peppers, mushrooms, carrots, and garlic. Rinse the Farro grains before adding them to the stew. Add Farro, chickpeas, broth, water and bay leaves. Deglaze the pan by scraping the brown bits from the pot. When these dissolve into your sauce, they will add extra flavor. Garnish with sliced green onions and serve. Enjoy! 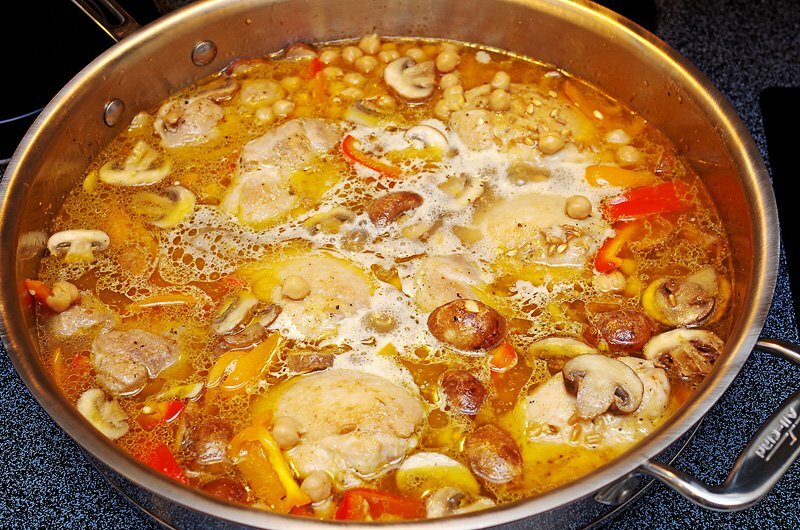 If you like more liquid in your stew, just add more broth/water combo.